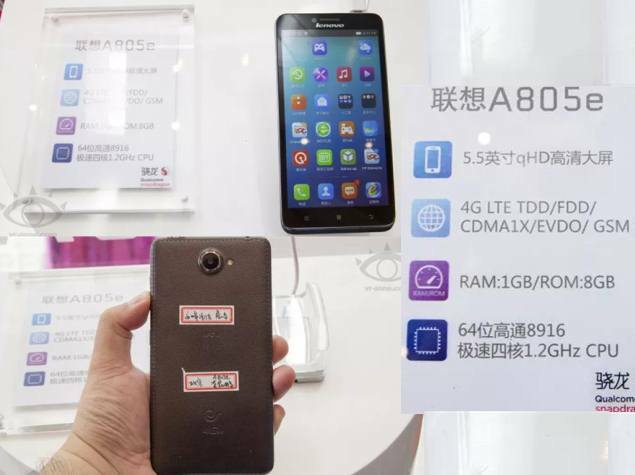 Lenovo has unveiled a large-screen smartphone running a 64-bit Qualcomm Snapdragon 410 processor – the Lenovo A805e – at the Tianyi Mobile Fair & Mobile Internet Forum organised by China Telecom.While the pricing and availability is not officially announced for the Lenovo A805e, reports indicate it might release in the middle July, which is earlier than originally slated, priced under $200 (approximately Rs. 12,000).According to VRZone, the Lenovo A805e is a dual-SIM device with a 5.5-inch qHD (540×960 pixels) display. It is powered by a 64-bit quad-core 1.2GHz Snapdragon 410 processor coupled with 1GB of RAM and Adreno 306 GPU. The primary rear camera on the Lenovo A805e features an 8-megapixel sensor, however, while a front-facing camera is present, its resolution is not known. The Lenovo A805e is backed by a 2500mAh battery and offers NFC and 4G LTE connectivity. The handset will be available in Black, White or Champagne Gold, and features a faux leather design(see above) by Lenovo. Other than the Lenovo A805e, LG also showcased the G3 Beat at the exhibition event by China Telecom and Qualcomm, a smartphone that is expected to be called the LG G3 mini when it is launched globally. With no word on its price and availability, the LG G3 Beat (LGD728) comes with a 5-inch IPS display, contrary to the 4.5-inch display expected on the LG G3 mini. The firm has also dropped the screen resolution from QHD (1440×2560 pixel) on LG G3 to the considerably lower HD resolution of 720×1280 pixels on the LG G3 Beat. Password sync, now on IE11 on Microsoft’s newest operating systems, makes moving among PCs, phones, and tablets easier. It’s also handy for Microsoft to keep customers in its ecosystem. With the latest versions of its desktop and mobile operating systems, Microsoft synchronizes passwords for websites people visit with the Internet Explorer browser. The sync service means that a password entered on IE11 on Windows 8.1 will be migrated to IE11 running on Windows Phone 8.1, Microsoft said in a blog post on Monday. IE11 also does a better job of detecting login pages so that users will be prompted to save passwords more often. Passwords, although an onerous part of the computing world, are ever more common as companies try to build direct relationships with customers through user accounts. Making passwords easier to handle — especially on mobile devices where it’s harder to type oddball combinations of letters, numbers, and punctuation — is a significant time-saver for people. Sync services are also a good way to encourage people to keep using the same browser. Once a browser remembers how to log in automatically on a lot of sites, moving to another browser is more of a hassle. That’s especially true when people forget their passwords. Microsoft is no doubt keen on keeping its IE users loyal as it faces strong desktop competition from Google Chrome and Mozilla Firefox and strong mobile competition from Chrome and Apple Safari. Microsoft has another lever to push here, too: Windows apps distributed through its app store. These apps can use Web technology for login through Microsoft technology called the Web authentication broker. Browser sync services have become a bigger deal as computing companies branched out to tablets and smartphones. With browsers spanning those machines and others like TVs, cars, and game consoles, sync services can ease the difficulties people have moving from one machine to another. Arbel (Creator of this App,) said in a conversation with the TechCrunch that the app was “having security issues,” and that specialists were working to alleviate the problems in the next few hours. TechCrunch also got an email from the group of college students claiming to have hacked the Yo App. The group said that we are able to access any Yo’s user phone number and send Yo’s and push notifications to users. It means they could also push notification of any Malicious URL too. I know, some of you don’t know about this App, like me, because this app is shining like a star from Last month, when its creators raised over $1 million from investors and the number of users has skyrocketed to over 50,000 in the last month. Microsoft doesn’t mention IPv6 in the blog post, but the use of the protocol would make its address problems disappear. The newer version of the Internet Protocol adds an almost inexhaustible number of addresses thanks to a 128-bit long address field, compared to the 32 bits used by version 4. Since every connected device on the Internet needs an IP address, there will be increasing pressure to move to IPv6 as more non-computer devices come online in the so-called Internet of things. 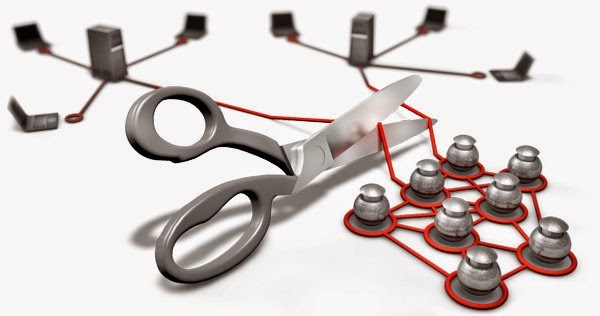 Smaller companies are already doing this to keep their businesses going, and we’ll likely see more of it in the future, according to Jörgen Eriksson, project manager for IPv6 at .SE, the organization in charge of the Swedish top domain. As the RIRs (Regional Internet Registries) have started to run out of version 4 addresses, the need to implement IPv6 has become more acute. The RIR’s job is to manage, distribute, and register IP addresses within their respective regions. Microsoft says like most other vendors that it’s committed to the rollout of IPv6. The foundational work to enable IPv6 on Azure is well underway, according to an FAQ. However, it’s unable to share a date when IPv6 support will be generally available at this time, it said. “People are distracted by trying to make money, and only looking at next week’s priorities. But at some point IPv6 will be next week’s priority, and there will be some problems,” Pawlik said. Many Hackers able to find bugs inside Facebook that could allow them to hack a Facebook account, and again in the hacking world, one of the Indian hacker able to make a facebook hacking tool that was able to hack any newly created Facebook accounts. For a new account you have to signup over there and Facebook sends a verification code on to your email account and Abhibandu made a handsome code to easily crack that code in just 15 minutes. This attack could takeover on those Facebook accounts that doesn’t verified their accounts, so the next question is—how can we find an account which is unverified? Abhibandu was able to do so either by guessing with an email address until Facebook asked to confirm the account, or by searching for emails on Facebook to see if they were verified. Either way, it wasn’t too hard for Abhibandu. At Last, Abhibandu reported the hack to Facebook and within eight hours, he got a response from the fb security team. In the meantime this loop hole has been fixed by Facebook and Abhibandu received a nice bounty payout for notifying Facebook. Last month it was revealed that some of the Chinese officials hacked US companies to acquire trade secrets ,and now again a revelation comes out against China that its hacking group linked to Shanghai-based unit 61486 of the People’s Liberation Army 12th bureau may have targeted U.S. defense and European satellite and aerospace industries since 2007, according to network security company CrowdStrike Inc. The hacking group known as Putter Panda and continuing its spying since 2007. CrowdStirke were tracking them from several years and they decided after the indictment of the Chinese officers to publish a report on their findings, to call attention to the breadth of the military’s actions. The Putter Panda said to be a part of the 12th Bureau of the PLA’s 3rd General Staff Detaprtment based in Shanghai, CrowdStrike said. They Identified Chen Ping (cpyy)—Responsible for administration behind the malware used in the attacks and for the domains too which being used in exploiting the popular productivity applications such as Adobe (ADBE) Reader and Microsoft Office to deploy custom malware through targeted e-mail attacks, domains are registered by Chen Ping. According to the CrowdStrike research the group targeted victims with custom malware disguised as emails that containing PDF Invitations to aerospace and satellite conferences, job postings and also used the brochure of a Yoga Studio in Toulouse. Once clicking the Files, they download malicious programs onto victim’s computer and after that they can see other devices and networks you connected to and eventually steal trade secrets and design schematics for satellite and aerospace technology. Just after few days of news came out that China is accused of hacking into US companies, It was the headline that the United States government may use visa restrictions to prevent Chinese hackers from attending the most important hacking conferences that will be held in Las Vegas this August: DefCon and Black Hat. Read a Full Report HERE. You can read and download a Full Report from CrowdStrike Here. It is already in the news that Anonymous group of hackers mainly from Brazil and also from all over the world going to hit this season’s World Cup Sponsors with Cyber-Attacks. Hackers dubbed this operation “#OpWorldCup,” you can also find many related tweets to the event through searching for the following Hash-tags: #tangodown, #Anonymous, #Brazil and #Worldcup. You will find the answer HERE, if you are thinking why hackers are attacking the Brazil World Cup 2014. The U.S Department of Justice announced that FBI and other international Law enforcements have disrupted two of the world’s most notorious botnets: GameOver Zeus and Cryptolocker ransomware. Game Over Zeus is one of the most notorious botnets which first emerged in September 2011 responsible for millions of infections worldwide. It is based on the original Zeus malware, attempts to steal financial information from the victim. According to the United States Department of Justice report, the cybercriminals behind the GameOver Zeus have stolen more than $100 million. Evgeniy Mikhailovich Bogachev, 30-year-old Russian, has been charged for his alleged role as an admin of the Gameover Zeus botnet. Cryptolocker is a particularly nasty piece of malware that encrypts all files on the infected machine, then demands a ransom to unlock it. If the files are important one and no backup is there, victims don’t have choice other than paying ransom to get a key to unlock. DOJ report suggests that more than 200k computers have been infected by this ransomware as of April. The malware appeared in September 2013, within two months cyber criminals collected more than $27 million. Symantec has also released a tool to remove GameOver malware completely from your computer. You can download it from here. Just like World Wide Web, here is World Wide Anonymous group (which contains Activists,) and now they are planning to disturb the Fifa World Cup 2014 in Brazil through Cyber-Attacks. Anonymous are going to target sponsors of this Word Cup, and below is the reason WHY? The group is really angry with the Lavish spending on the games in Brazil and the country is struggling to provide basic services, “We will not stay quiet,” one of the hacker says. Earlier this week, Hackers already attacked the Brazil’s Foreign Ministry computer networks and leaked dozens of confidential emails. In the attack a hacker AnonManifest used phishing tactics to hack into the Foreign Ministry’s databases and access emails. “This time we are targeting the sponsors of the World Cup,” he said in a Skype conversation with Reuters from an undisclosed location in Brazil. Who is the Target from Sponsors? Before this, Brazil already is cracked by the protesters, which are upset on the same thing (Government for pumping millions of dollars into the funding,) that Anonymous makes the Motive to attack this World Cup. Brazilians are angry with their government for pumping millions of dollars into the funding of an eight-week extravagance and that money being spent on the World Cup is instead desperately needed for education, sanitisation, hospitals and the eradication of violence, drugs and weapons from their streets, Huffingtonpost writes. Right now, FIFA World Cup has been scheduled from 12 June to 13 July 2014 and this is the second time, Brazil is hosting the World Cup. The day is near, and attacks are bigger, so we will not confuse you by adding some more words, we will just wait and watch and if there is any attack goes on, we will update you asap.